President Donald Trump issued an executive order Feb. 28 directing federal agencies to revise the Clean Water Rule, a major regulation published by the Environmental Protection Agency and the Army Corps of Engineers in 2015. The rule’s purpose is to clarify which water bodies and wetlands are federally protected under the Clean Water Act. 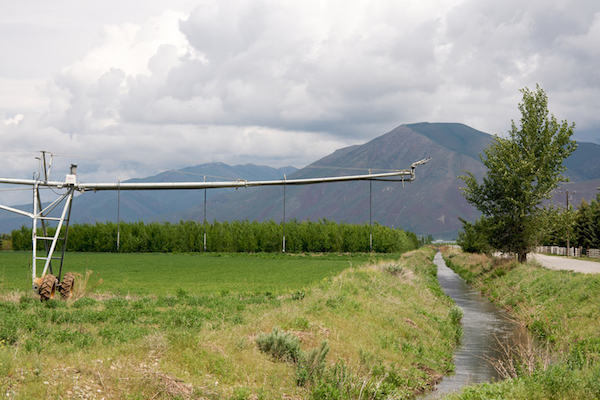 Irrigation ditch and sprinkler, Silver Creek, Idaho. The EPA estimated that the final Clean Water Rule expanded the types of water subject to Clean Water Act jurisdiction by about 3 percent, or 1,500 acres nationwide. Opponents clearly think it could be much broader — and until they see the rule implemented on the landscape, their fears may have some basis in fact. Connections between upstream and downstream waters. Farmers and ranchers are independent by nature and believe they know what is best for the stewardship of their own land. They tend to be regulation averse and believe voluntary approaches to water quality provide the flexibility needed to account for site-specific variations across the landscape. However, science shows that relatively minor effects at the edge of one field can aggregate across a watershed in cumulative impacts that are significant and sometimes serious. David J. Cooper receives funding from a contractor working for EPA and served as an external peer reviewer on an EPA report, “Connectivity of Streams and Wetlands to Downstream Waters,” published in 2015. Which tributaries should be protected like the rivers they feed?